Kia MPV due in 2013 | What Car? A new Kia MPV will go on sale in 2013, company sources told What Car? at the Geneva motor show. 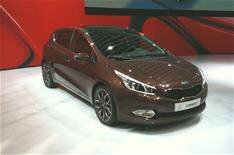 Paul Philpott, Kia Motors Europe CEO, said that the new seven-seat model will replace the Carens and Sedona. Itll be based on the all-new Ceed that was revealed at the show. Kia has launched new or refreshed versions of all of its models during the past two years, but has not launched an all-new MPV for a long time. The popularity of large MPVs is declining, Philpott says, so the new MPV which is yet to be named will focus on providing flexible seating in a compact package. Its likely to use the same range of engines as the Ceed, although it might not get the lowest-powered versions. A closely related Hyundai MPV based on the new i30 is expected to be launched at around the same time.